The holidays are here and the end of 2015 is rapidly approaching. There are a lot of projects in the works on the railroad so I thought I'd provide a quick update on recent activity. The new panel design has been finalized and the first one is shown below. 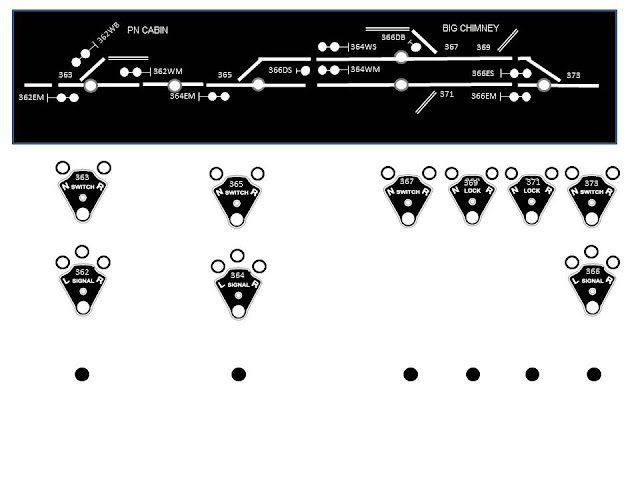 As I've mentioned before, the new panels will utilize route selection versus turnout controls. This should simplify operation for the crews as some have found the toggles confusing. 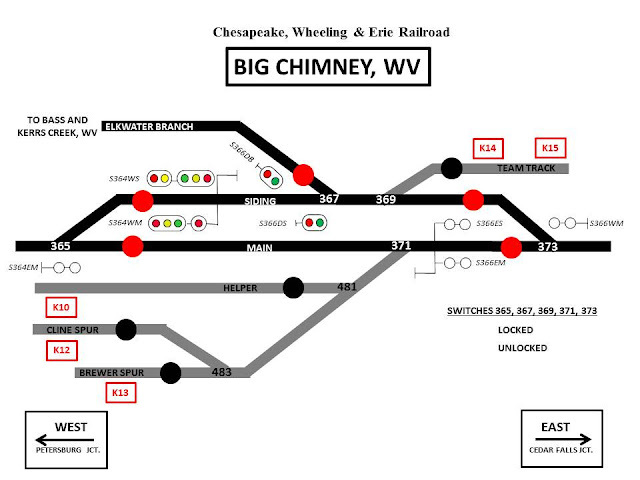 The system will be run by the Route Control System (RCS) developed by Gerry Albers and sold by his Signals By Spreadsheet company (http://www.signalsbyspreadsheet.com/). More on this later. The new panels will be printed on Avery full sheet labels, given a light coat of clear gloss to protect them, and then mounted directly on the existing panels. There are five signals in the vicinity of Big Chimney that either aren't visible from the aisle or are difficult to see. The solution to this is to provide repeater signals on the panel. Holes will be drilled and LED's installed in each of the targets on the panel which in turn will mirror the aspects in the field. Four of the repeater signals are on the Big Chimney panel and the fifth will be on the Cedar Falls Jct. panel. While this sounds great is concept, it requires wiring another complete signal for each one repeated. Needless to say, I'm glad there are only two other signals on the railroad that will require this setup. The photo below shows the repeater signal terminals wired up and awaiting the leads from the LED's. The first RCS card has been installed and is shown in the photo below. It can control up to eight turnouts. Also shown to the left of the RCS card are the Tortoise drivers (TD8's) which are wired directly to the switch motors and control their movement based upon input from the RCS card. After the next op session, all the toggle switches will be pulled and the Tortoises will be wired to the TD8's. One of the SPDT switches on each Tortoise will be used for power routing for the frogs and all of this wiring is now in place. The next photo shows the current mock-up for a portion of the CTC panel that controls Big Chimney. The panel itself will be in the crew lounge outside of the layout room. Part of the beauty of the SBS system is that there will only be one wire between the layout and the panel. In addition to the signalling project, the scenery around the caboose service area is just about complete. Some more vegetation will be added along with some additional details. The rails have been put down in the roundhouse and the two radial tracks although they haven't been wired yet. The walls are being held in place temporarily with small blocks of wood. I haven't decided yet just what I'm going to do with all of the doors and windows. And the two N&W SD35's that see regular service on the Nelsonville Turn are in the shop being completely stripped and cleaned. They'll get Tsunami decoders and sugar cube speakers along with some weathering before going back out on the railroad. There are a number of other projects in the works, including another SD40 and a two-bay hopper car for sand service that are in the paint shop, the fuel unloading cranes, a pump house for the diesel fuel service area at North Pierce and some additional small detail items like mailboxes and fire extinguishers. More progress to come in the new year, but for now, I hope everyone has a very Merry Christmas and a great 2016! While working on the scenery and structures around the engine service area at North Pierce, I happened to notice that there was some extra room at the end of the spur where tank cars of diesel fuel will be spotted for unloading. That led me to place a boxcar at the end of the spur to see just how much room there really is. So with a boxcar spotted as above, would there still be enough room for two tank cars to be spotted at the fuel unloading cranes? If I moved one of the cranes closer to the turnout, it might be able to unload a car on either the Supply 2 or the adjacent Supply 1 spur. I mounted one of the unpainted cranes to check clearances, and sure enough, it works. As can be seen in the photo below, Supply 1 will also accommodate two tank cars and a boxcar. So the old water treatment building next to the water tank is now used for storing supplies and a boxcar will be spotted there occasionally for unloading. It's always great to find another location to receive cars during an operating session, especially given the limited amount of switching on the railroad. And it's these types of finds that can really ramp up the enthusiasm to get a particular area finished.